This racket is a modified version of the Dunlop Hyperfibre+ Revelation Pro, a.k.a. the Ali Farag model. The Ali Farag model is much more head-heavy, while this one, the Pro Lite, it evenly balanced. I got a chance to review the Revelation Pro Lite. In short, loved it, and I prefer the Pro Lite over the Ali Farag, although that racket has many fans. Really nice racket! I measure with default grip and strings a weight of 155g with a balance point of 362mm. The racket feels head light in the sense there isn’t much weight in the head (duh) but where there is weight is exactly adjacent to the sweet spot of the racket so although it’s light you get a really solid hit at impact. The fact the balance is 262mm is probably due to the high placement of the weight and not due the amount of weight itself if that makes sense and it still feels head light, just solid. Amazing racket. I preferred the Evolution to this one becuase it’s more powerful but retains manoeuvrability (though not as much). I would target this at someone looking for a head light racket but one with good stiffness, solidity and limited vibration (head light will always vibrate more). We’re just getting towards the end of the squash season here in the UK. I’ve been playing with the Dunlop Pro lite all season. It’s a great racket combing power and touch but I’ve gone through 3 of them this season. I play 1st division North West counties which is a reasonable standard. Speaking to other players in the same division, ignoring the pro’s who play in the division most players would expect to go through 1 or 2 rackets a season so the durability is a bit of a question mark over this model particularly when you’re paying £80 a racket. I’ve always played Dunlop so will probably consider changing to Evolution or a Precision which the frames look a bit more solid. “I appreciate lightweight head light rackets. I am currently playing with the Head SpeedTouch SlimBody 120. It is an excellent racket and I am happy playing with it. However, for sometime now I have been itching to try some of the Dunlop rackets. 1- The “Hyperfibre+ Revelation Pro Lite” being advertised as a head light version of Ali Farag’s racket. It weighs ~ 150 grams which is close enough to the 145 grams that my SB120 weighs, and the price was also quite attractive on Amazon UK at £79. 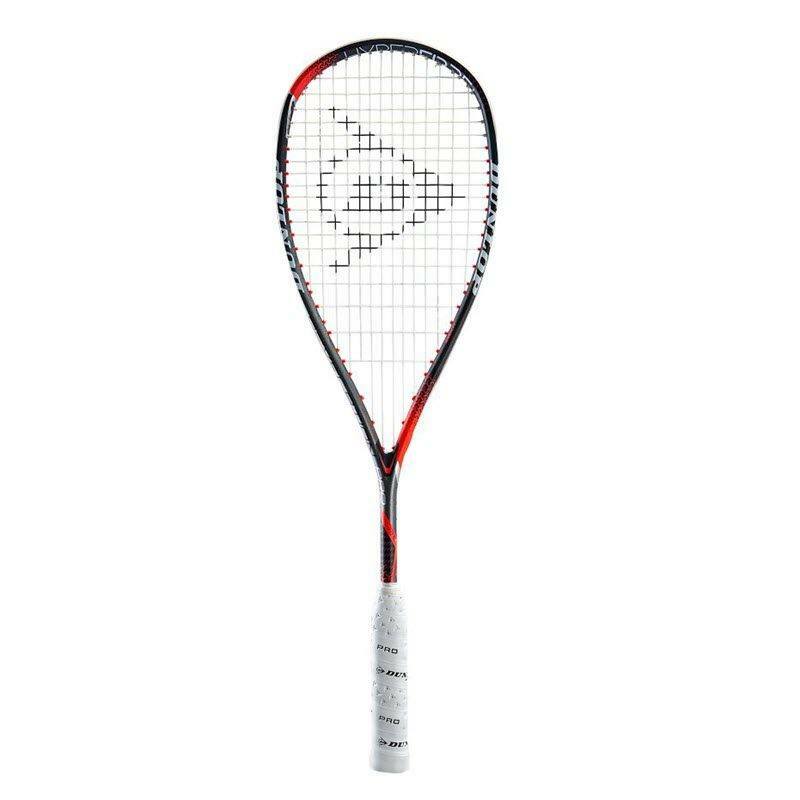 2- Nick Matthew’s “Hyperfibre+ Evolution Pro” which is 3 grams heavier, advertised as an extra head light racket, has a killer design, and £20 more expensive. 3- The “Hyperfibre+ Revelation 125” which is said to be a redesign of the old Force 125 model. This is my most likely candidate. It weighs 150 grams, advertised as an extra head light racket, has a higher power rating than the other two, has a very good design (though not as pretty as Matthew’s), and sells for £80. What makes me enthusiastic about this choice is that Nour ElTayeb; who used the same Head SB120 that I play with; chose this racket when she signed with Dunlop. So I guess this is the closest match. Hi, Head makes great racquets, there is nothing with Dunlop racquets that makes it better/more advantageous for you to use over your current Head racquet. If you’re happy with your Head racquet, stick with it! Changing racquets usually requires some time, a month or more, to completely get used to. For what it’s worth, there are as many pros playing with Head racquets as there are playing with Dunlop. I think you’re right that that Revelation 125, of all the Dunlops, is probably the closest one to your Head racket. But I do kind of agree with D’s comment that if the Head is working for you, stick with it! These all have slight differences, and you can check out the below spreadsheet to see the measurements I took on some of these rackets (the Dunlops mostly). Hopefully that helps! You should provide a link to this table under Rackets main page; the database is quite helpful! I play with the Head 120 slimbody graphene strung with dnamax 1.18 at 23 lbs and have a second 120 sb strung with x one bi phase 18 also at 23lbs in the fan pattern.Great racket for summer conditions but i find slightly underpowered for cold court conditions. My “winter”racket is the Head graphene xt cyano 135 head light strung with tech 305 green 1.1mm at 24 lbs,great power and control for my club player abilities! Try a heavier frame,say 135 to 140g,headlight for cooler conditions. This summer/winter tactic has been the biggest revelation for me in 5 years of playing! The new Dunlops interest me too! Can you compare the pro lite to the technfibre carboflex 125x (el shorbagy model)? Both are 125, they seem similar….but your thoughts? I tested these side by side and recorded a little video. Will publish it after I’m back from holiday. They’re pretty similar in terms of the specs but do feel a little different when compared side by side. I’d like to see that video very much. I love the Ali farag model and didn’t like the Carboflex 125 at all. Want to buy the lite version, but if it is like carboflex, then I pass. Your reviews are great! How does the power in this racket compare to the Farag signature version? I’ve been using the Carboflex 125s for the last few years, but I am looking to change and can’t decide between Dunlop Hyperfibre+ Revelation Pro / Lite versions. Thanks Tom! I didn’t get to try the Pro and Pro Lite head to head. Because the Revelation Pro / Ali Farag is heavier in the head, I find you get more power — IF you have good racket prep. The Pro Lite is quicker through the air so you can generate power with less prep (shorter backswing). My problem with the Revelation Pro / Ali Farag is by the end of the match my weak little chicken-arms are tired and I just can’t get the racket up as consistently, so the power advantage starts to drop off. That’s why I like the Pro Lite better.